You know how I wrote about gorgeous 80+ degree weather and sunny skies just yesterday? Well last night at about 3am, I was woken up by the sounds of howling wind and rain and felt like I was going to be the star in the sequel to Twister. Luckily, that didn’t happen. But that type of fast change sure is confusing. And I thought the saying was that “March comes in like a lion, out like a lamb?” So far, April is roaring fiercer than the past month. Now that I have grey skies and wet feet, I’m craving some comfort food. I’ve realized that my appetite is easily swayed by the weather. What’s more comforting than some doughy bread, butter, and cheese? Not much, in my opinion. I concocted this little sandwich and will be wrapping it up to take with me for lunch today. Just like this weather, it seems a bit confusing. It seems that it wants to be your typical grilled cheese, but then it gets a little bit of French influence from adding jam and not-your-typical cheeses. Even though it’s odd, it’s good, and will make this rainy day a little bit brighter. Heat a small pan over medium heat and spray with non-stick cooking spray. While pan heats, spread butter onto each slice of bread to coat evenly. Flip over one of the bread slices, and spread jam onto the opposing side. Place the non-jammed slice of bread with the butter side facing down into the pan. 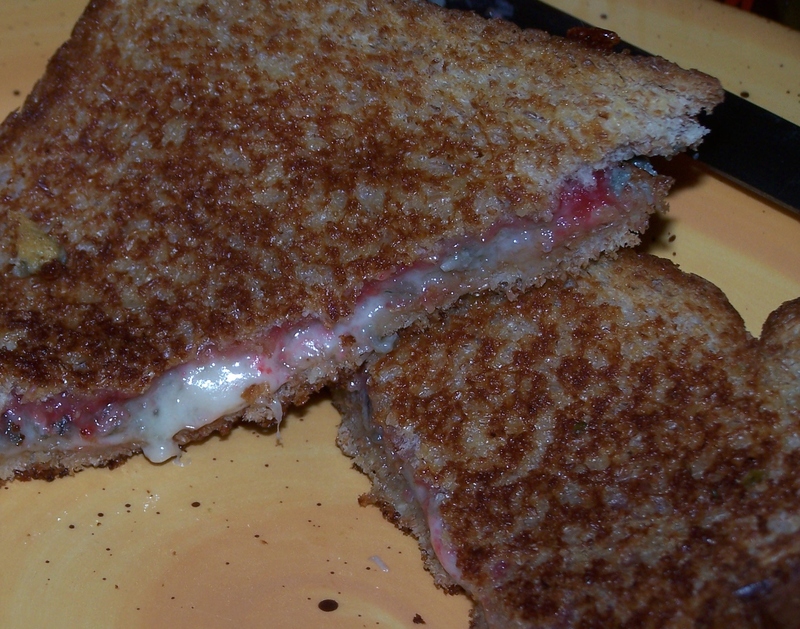 Top with the mixture of cheeses and then the other slice of bread, leaving the buttered side up top. Let cook for 4 to 6 minutes, until bread is golden brown. Flip over carefully with a spatula, and cook the other side for another 2 to 3 minutes until it is just as golden. Remove from heat, slice, and enjoy. What about today are you celebrating, and just how are you celebrating it? I am celebrating and anxiously anticipating tonight’s men’s basketball matchup between Duke University’s Blue Devils and University of North Carolina’s Tar Heels. As I mentioned in my post yesterday, the rivalry between these two teams puts all other rivalries to shame in my book. It’s pretty exciting to be in the Triangle right now. 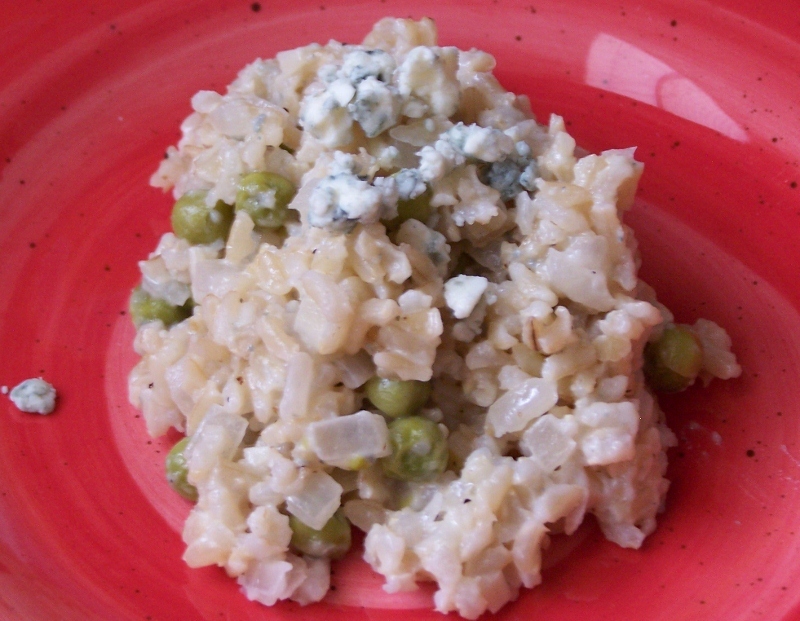 Enter Duke Blue Cheese Risotto. This recipe stemmed from a need to clean out my fridge (I’ve been trying to figure out what to make with the leftover blue cheese from my birthday party pizzas) and today’s big game. 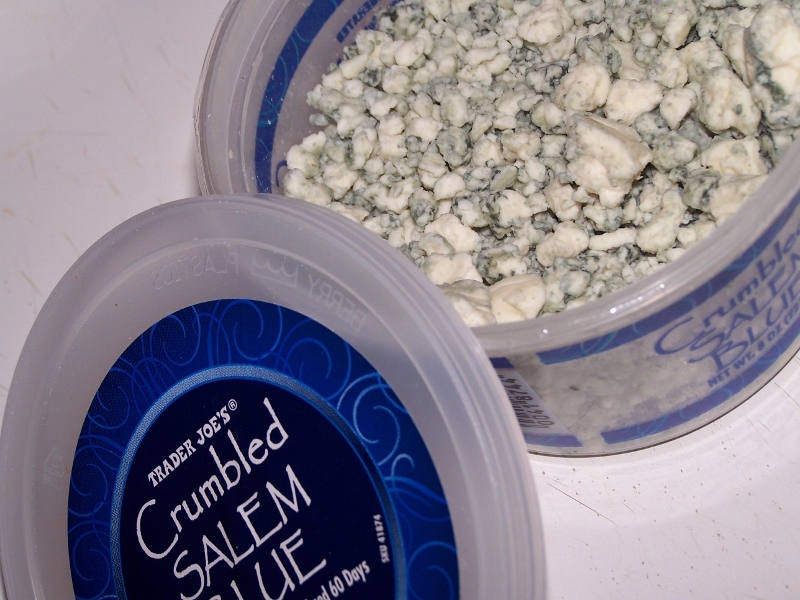 Nothing like showing you bleed Duke blue by consuming some stinky blue cheese. 1. I really never had anything to worry about because making risotto is extremely easy. 2. If you step away from the stove for a couple minutes, the risotto won’t be ruined. There’s no need to be a helicopter cook and hover. I promise this is delicious…make it tonight. 1. Heat chicken stock in a saucepan over medium heat. 2. In a large sauté pan, heat olive oil over medium. Add garlic and onion, sauté for 3 to 4 minutes. 3. Add in frozen peas and heat until warmed through. 4. Add in rice and mix well to coat the grains in oil. Toast for 2 minutes. 5. Pour in wine and allow to boil off (keep temperature at medium to medium-low). Once most of the liquid has been absorbed, it’s time to start adding the broth! 6. Using a ladle, add about ½ to 1 cup of broth to the rice mixture. Stir risotto occassionally as the liquid absorbs. When you stir the risotto and no liquid separates from the rice, but it’s still moist, add another ladle of stock. 7. Continue the process of stirring and adding more broth until the starch in the rice starts to break down, the grains look creamy, and suit your desired level of tenderness (I like my risotto to be softer, less al dente). This took me about 20 minutes using brown rice*. 8. Once the rice is cooked, reduce heat to medium low, add blue cheese crumbles, and season with salt and black pepper to taste. 9. Swirl in a bit of honey. This sweet finishing touch complements the blue cheese perfectly! A little honey goes a long way in this dish. *Note: Traditional risotto uses arborio rice. I simply used brown rice because that’s what I had on hand. Arborio rice may need additional liquid and cooking time. And since it is a Wednesday….it’s time for wine of the week! I used the $3.99 bottle that the Berserk Mushroom lady recommended to me a couple weeks back in the risotto, and it is delicious! 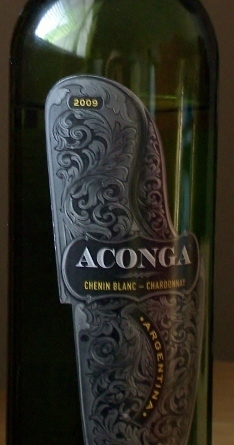 Aconga 2009 Chenin Blanc-Chardonnay blend from Argentina. I found it right in my local grocery store and hopefully you can, too. It’s excellent for the price!